I’m a huge fan of alternative pastas – those made from beans or lentils – especially when they are the vehicle to get more veggies in. I’ve tried just about every variety of bean and lentil pasta, and I personally love chickpea pasta. It’s extremely high in protein and fiber, making it extra filling. 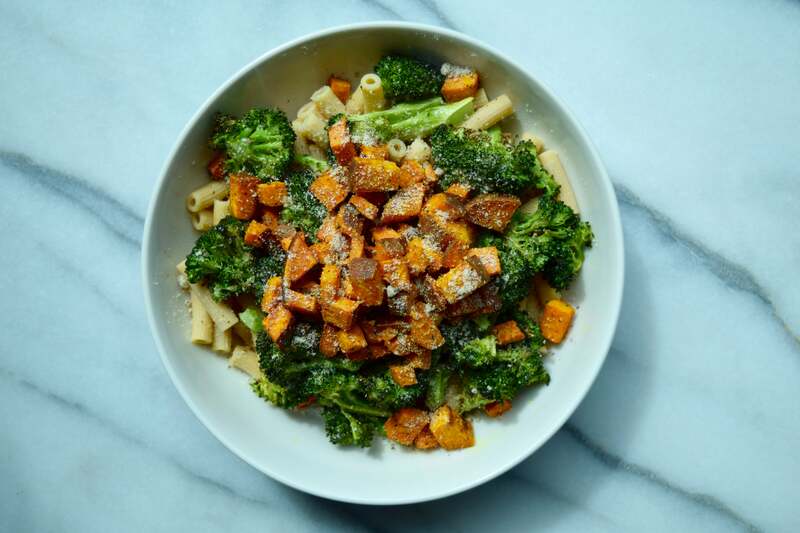 For example, a 2 oz (dry) serving of Banza chickpea pasta has an impressive 14g of protein and 8g of fiber. Chickpea pasta is popping up beyond just the health food store, in some more progressive grocery stores. But, I personally prefer to buy my dry goods online, because they are typically significantly cheaper than a regular supermarket or health food store. The brands I prefer is Banza. It comes in a variety of pasta shapes. You can find them on Thrive Market for over 25% off retail price (use the link to get 20% off your first 3 orders!). Chop sweet potato into small, 1-cm cubes. Lay out on a baking sheet, drizzle with olive oil, garlic powder, salt, and pepper. Toss well, and arrange sweet potatoes in a single layer with space in between pieces, so they cook evenly. Put in the oven and cook for 20 minutes, turning half way through. Chop the broccoli into bite-size florets, lay out on a second pan, drizzle with olive oil, garlic powder, salt, and pepper. Toss well, arrange in a single layer with space in between, and put it in the oven for about 20 minutes. When the water is boiling, add chickpea pasta. Cook for 9 minutes. Drain. 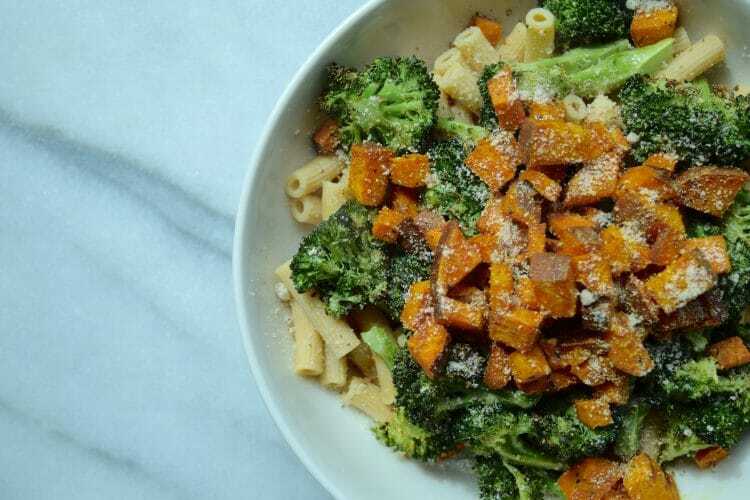 Put the pasta in a bowl, top with the sweet potato and broccoli once they're ready. Top with a drizzle of olive oil, salt, pepper, and almond flour (if you wish). Feel free to add whatever spices you like when roasting. Try adding turmeric and cumin on the sweet potatoes, or oregano and thyme.